Amber Holcomb's "American Idol" journey came to an end Thursday night (May 2), as the 18-year-old Houston, Texas, native was voted off the show in a tearful goodbye. 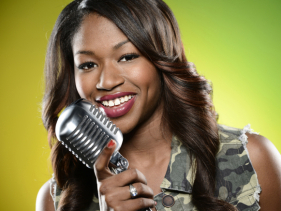 Holcomb's exit leaves a top three of Angie Miller, Candice Glover and Kree Harrison. Holcomb had a strike against her going into this week, as she placed in last week's bottom two, and since no one was eliminated last week, votes were combined from last week and this week's performance episodes. More than 81 million votes were cast over the two weeks, according to host Ryan Seacrest. Holcomb, compared to a young Whitney Houston by judge Nicki Minaj this season, sang Houston's "I Believe in You and Me" as her exit song. At the close of the song, she broke down in tears, leaving Mariah Carey crying at the judges' table. On Wednesday's performance episode, Holcomb received mixed reviews for her take on Pink and Nate Ruess' "Just Give Me a Reason" but wowed the judges with her simmering take on "My Funny Valentine" — despite revealing that she figured the song was about "a guy, who I guess they're being like really funny and weird." In reviewing the week's performances, "Idol" mentor Jimmy Iovine said she "crushed" "My Funny Valentine," while acknowledging she had "a lot of ground to make up" from last week. "Is this enough to save her? I don't know, but I hope so," he said. Holcomb was in the bottom two along with Harrison. Now Harrison, along with Miller and Glover — the week's top two finishers — is headed home for her "Idol" hometown visit. In giving advice to the contestants before the results came in, Nicki Minaj urged, "No tears tonight. It's just the beginning of something great." After Minaj and Carey's dustup on Wednesday's show — along withMinaj's pointed tweets at Carey on Thursday — no mention was made of the two judges' rivalry on Thursday's show. The episode also featured a trio of guest performances: Season-seven winner David Cook returned to the "Idol" stage to perform his new single "Laying Me Low"; Harry Connick Jr. did his new song "Every Man Should Know"; and in a pre-taped performance, will.i.am offered up his "Great Gatsby" soundtrack selection "Bang Bang."